I’m a big fan of Timmy but I think we’re being overly optimistic about “The King” being a 2020 contender. I’ll reserve my judgement until we see some footage next year but, I know that the track record for these niche films aren’t that great. Macbeth had great cast, cinematography and performances but failed to deliver…..we’ll see if Netflix can pull this off. I see what you mean but unlike “Macbeth”, “The King” has a solid team behind it with Dede Gardner, Jeremy Kleiner and Brad Pitt producing. They’ve been responsible for other successful films like Moonlight, The Big Short, 12 Years A Slave and The Tree of Life. They are also producers of potential 2019 contenders like Backseat, If Beale Street Could Talk, Ad Astra and Beautiful Boy. Both films are being directed by Finnish director Dome Karukoski, who has moved into directing American films after the critical success of his previous (Finnish-language) film, Tom of Finland. Right now Tolkien is well into post-production and can still have a 2018 release, but there appear to be problems in the editing and distributing process, and a release push-back to 2019 is becoming increasingly likely. Once Tolkien is released, I can easily see Oscar campaigns for Best Actor (Nicholas Hoult), Best Supporting Actor (Tom Glynn-Carney), Best Supporting Actor (Craig Roberts), and Best Supporting Actress (Lily Collins). If Tolkien is released this year, then we need to start talking about The Starling (if not, we can postpone that talk at least until the “2021 Oscar Predictions” thread is created). Right now, that film is in pre-production, but can easily start filming this fall and be ready for an Awards Season 2019 release if things go right with Tolkien. Once The Starling is released, I can easily see Oscar campaigns for Best Actor (Keanu Reeves), Best Supporting Actress (Isla Fisher), and one of the Supporting Acting categories for whoever plays the veterinarian character. Here are my updated predictions, listed in order of the likelihood of winning as always. 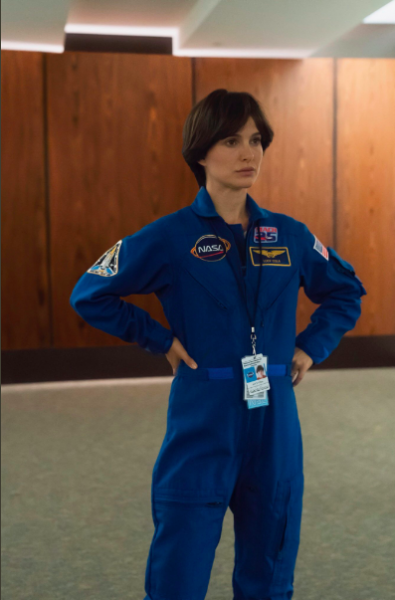 Sneak peak look at Natalie Portman in Pale Blue Dot. She’s coming for nomination #4 (and win #2)! So, it was just announced that Carrie Fisher will be in Star Wars: Episode IX despite the film being released three years after her death. Apparently, there’s enough unused footage of her from The Force Awakens to give Leia a meaningful storyline in Episode IX. If the film’s good, expect there to be a serious push for a posthumous Best Supporting Actress nomination for Fisher. So, it was just announced that Carrie Fisher will be in Star Wars: Episode IX despite the film being released three years after her death. Apparently, there’s enough unused footage of her from The Force Awakens to give Leia a meaningful storyline in Episode IX. If the film’s good, expect there to be a serious push for a posthumous Best Supporting Actress nomination for Fisher. I don’t see her being in it more than 10 minutes. It’s probably a peaceful and beautiful goodbye set up for her to honor her. I think they’re doing it more so they don’t have to address her death being off screen or digitalize her etc. It’s not unheard of for an actor or actress to be nominated for an Oscar with 10 minutes of screen-time or less. In fact, it’s not unheard of for an actor or actress to win an Oscar with 10 minutes of screen-time or less. Here are some examples. Gloria Grahame won Best Supporting Actress in 1953 for The Bad and the Beautiful with 9 1/2 minutes of screen-time. Hermione Bradley was nominated for Best Supporting Actress in 1960 for Room at the Top with 2 1/2 minutes of screen-time. Ben Johnson was nominated for Best Supporting Actor in 1972 for The Last Picture Show with 10 minutes of screen-time. In 1977, there were not one, but two nominations with 10 minutes of screen-time or less. Both nominations were for Network. Ned Beatty was nominated for Best Supporting Actor with 6 minutes of screen-time, and Beatrice Straight won Best Supporting Actress with 5 1/2 minutes of screen-time. Jason Robards won Best Supporting Actor in 1978 for Julia with 9 minutes of screen-time. Judi Dench won Best Supporting Actress in 1999 for Shakespeare in Love with 8 minutes of screen-time. Ruby Dee was nominated for Best Supporting Actress in 2008 for American Gangster with 10 minutes of screen-time. Viola Davis was nominated for Best Supporting Actress in 2009 for Doubt with 8 minutes of screen-time. Lol, it will still never happen in this case. Thank you for all the research you did for this, but as much of a Carrie fan as I am, she is barely going to be in it. I’m sure she’ll just be in it for a brief moment that will touch us all. They’re using footage from Force Awakens, which she was already in for just 10 minutes or even less. If somehow that does happen I’ll stan. Fisher was dead and had a sizeable role in The Last Jedi, but she still didn’t get even close. She has absolutely no chance for the next one. The Last Jedi was a good movie, but an abysmal Star Wars movie. The amount of controversy it caused among fans could have scared away Academy members who considered voting for it. If Episode IX doesn’t anger fans the way The Last Jedi did, Fisher may well have more of a chance. This reply was modified 8 months, 4 weeks ago by DaKardii. The topic ‘2020 Oscar Predictions’ is closed to new replies.